Caryl Churchill's plays are internationally performed, studied and acclaimed by practitioners, theatre scholars, critics and audiences alike. With fierce imagination the plays dramatise the anxieties and terrors of contemporary life. This Companion presents new scholarship on Churchill's extraordinary and ground-breaking work. Chapters explore a cluster of major plays in relation to pressing social topics - ecological crisis, sexual politics, revolution, terror and selfhood - providing close readings of texts in their theatrical, theoretical and historical contexts. 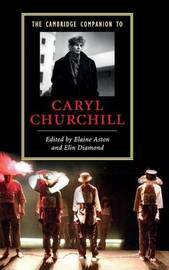 These topic-based essays are intercalated with other essays that delve into Churchill's major collaborations, her performance innovations and her influences on a new generation of playwrights. Contributors explore Churchill's career-long experimentation - her risk-taking that has reinvigorated the stage, both formally and politically. Providing a new critical platform for the study of a theatrical career that spans almost fifty years, the Companion pays fresh attention to Churchill's poetic precision, dark wit and inexhaustible creativity. Elaine Aston is Professor of Contemporary Performance at Lancaster University. Elin Diamond is Professor of English and Comparative Literature at Rutgers University.